The Latest in Celebrity News, Red Carpet Moments, Viral Videos and Breaking Celeb Rumors! : KELS FLICK: THE OBAMA'S IN CHURCH! 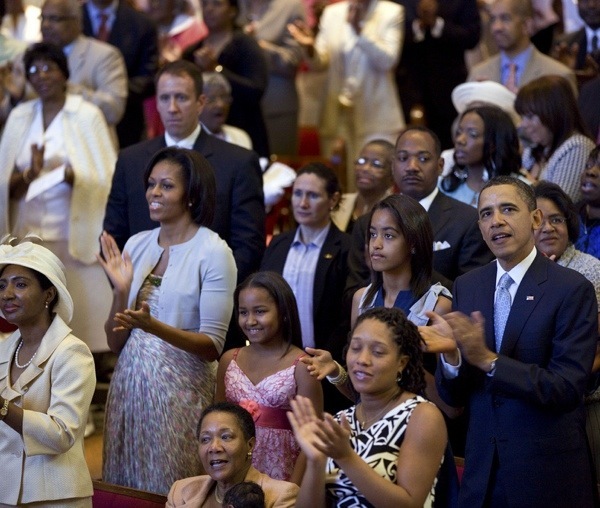 KELS FLICK: THE OBAMA'S IN CHURCH! The first family sat in the second row of Shiloh Baptist Church, founded in 1863 by freed slaves originally from Fredericksburg, Va. The senior pastor, the Rev. Dr. Wallace Charles Smith, welcomed the first family and told Obama that the church began praying for him and his family every Sunday starting two years ago. “So if you’re feeling blue and all of a sudden you feel a little better, that’s our prayers,” said Smith, according to Talking Points Memo. Obama, wearing a dark suit with a lavender tie, put his arm around his oldest daughter Malia and swayed to the 120-member strong choir – which included trumpeters, two drummers, an organist, a pianist, and a keyboardist – during the worship time. First Lady Michelle Obama wore a green and white print sundress with gray sweater and sat next to younger daughter Sasha. This is the second year in a row that Obama and his family have attended a historically black church for Easter. Last year, the first family celebrated Easter at Allen Chapel AME Church in Southeast Washington.